Our Climatedogs drive Australia’s climate in different ways at different times of the year. Currently, ENSO remains neutral but there is an approximately 50 per cent chance of an El Niño event developing in late spring/summer. Such late developing events have been hit and miss in the past. Indy finally went into real +IOD territory but has been exhibiting +IOD like behaviour for many months. Rainfall is likely to be below average across much of Australia with strongest chances for dry in the southeast. October shows a strong likelihood of drier conditions across the eastern two-thirds of the country. 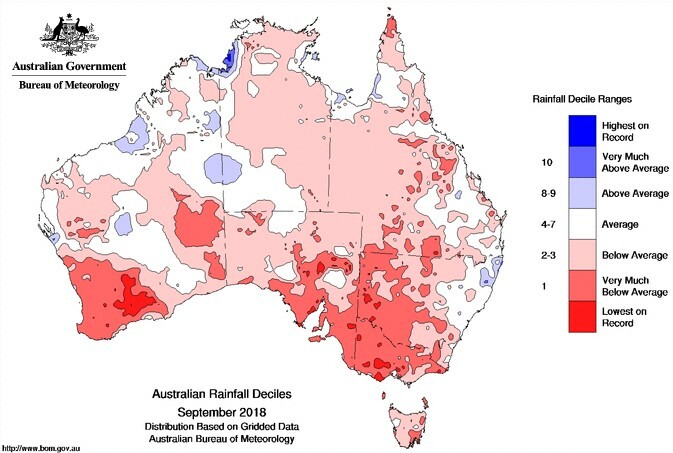 So far, large areas of Australia are looking dry, with some areas experiencing their lowest rainfall on record, but with no clear influence from the Climatedogs. Figure 1. Rainfall deciles for September 2018. Figure 2. 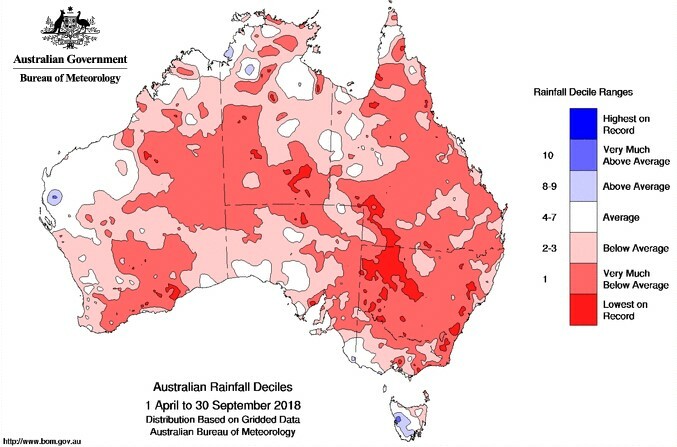 Rainfall deciles for April to September 2018. October to December is likely to be drier than average for many areas across the country, with strongest chances of a drier than average end to the year in Victoria and Tasmania. October is showing strong chances of a drier month for much of the eastern two-thirds of the country, except in NSW east of the Divide where there are roughly equal chances of a wetter or drier than average season. Figure 3. 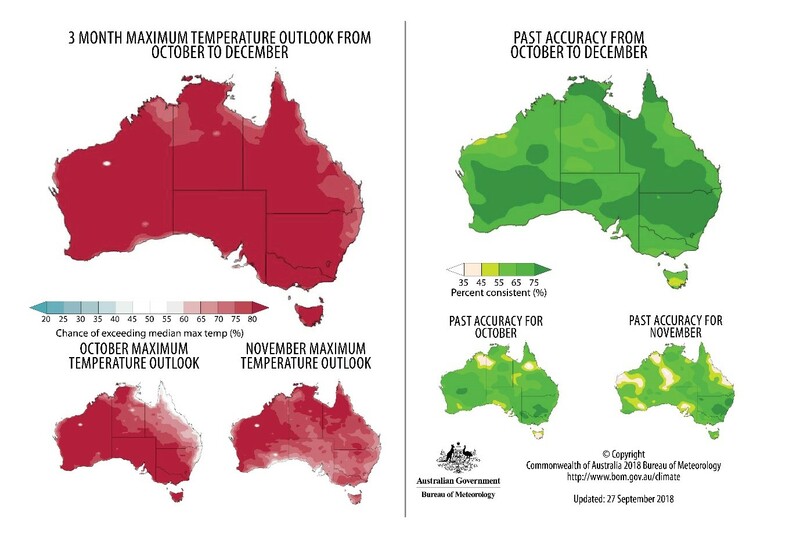 Australian outlook for October to December 2018. Maximum temperatures have been above average for large areas on the north east and east coast, while minimums have been mostly below average, except for a large area in South Australia which has been above average. 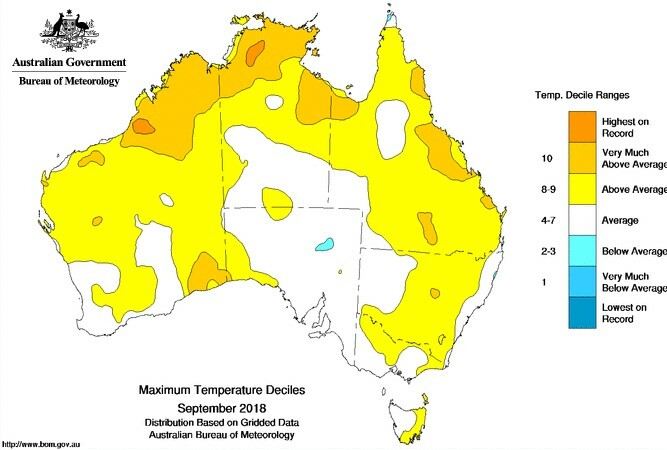 Figure 4. maximum temperature deciles for September 2018. Figure 5. 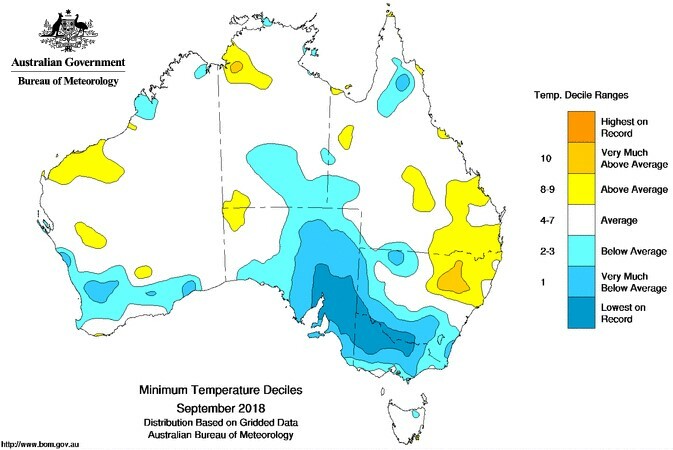 Minimum temperature deciles for September 2018. Forecasts suggest the whole country will experience above average maximum temperatures from October to December. Figure 6. October to December maximum temperature outlook, 27 September 2018. 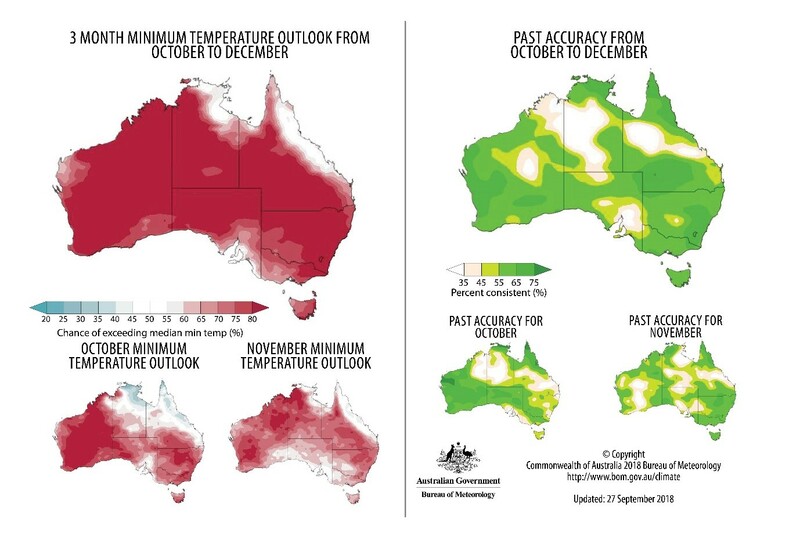 Minimum temperatures are forecast to be average to above average for Australia. In October, northern Australia is predicted to experience below average nightly temperatures. Figure 7. October to December minimum temperature outlook, 27 September 2018. Sea surface temperatures in the Pacific Ocean have remained stable at the slightly warmer than average side. Models are not providing a consensus on when they expect the sea surface temperatures to meet the El Niño threshold. Indy is finally measuring in the positive phase after many months of only sort of being positive. Models are predicting a move to positive in October before returning to neutral by the end of the year. The IOD would normally break down at the start of the northern wet season, this is usually at the start of November. At the start of August, Ridgy had moved north allowing frontal systems to move more freely through southern Australia. In September, Ridgy finally moved further south but still sits at a winter position (top of the Bight) as opposed to a normal spring position (around Adelaide). While a higher position is helpful in winter, its ceases to be useful in spring and summer, blocking tropical moisture flow. Ridgy has also increased in pressure over southern Australia, further blocking moisture triggers. From July to September, Sam was all over the place but spent much of August negative (pushing fronts up) and much of September positive (pulling fronts down). Come spring, Sam starts to have less influence over frontal rains. Eastie is a volatile dog and it’s hard to predict where he’ll pop up. It looks like Eastie may finally make an appearance off NSW in early October. Mojo has done nothing in September. He is predicted to show some intensity off the coast of Africa in early October before fading away as he moves eastwards into the Indian Ocean. Bursts of the northern wet season and the onset are often governed by MOJO’s behaviour.